It’s still summer, girls, and if you’re anything like us, your skin is continuing to suffer in the heat. Hot, sticky days and nights make it difficult to wear foundation and to use a good moisturizer. Active Moist from Dermalogica USA is a great option to help you slog through the remaining days of summer while keeping your problem skin areas well conditioned, soft, and grease-free. It’s oil-free, incredibly lightweight, and the perfect combination of silky smooth and nourishing, without weighing your skin down! Braids are back in a big way, and lately, we’ve been obsessed with all the different variations. Fishtail, milkmaid, 5-strand, you name it. They’re an excellent option on those mornings when you just can’t drag yourself out of bed in time to take a shower (braids hold best with day old strands). To mix it up a bit, try weaving in strands of fabric and pulling gently to create a new take on a classic look. If you don’t have strips of fabric, look for pre made thread hair wraps. They’re a great way to jazz up a long braid! Free People’s mixed thread braid-in’s are an awesome option, and they’re available in tons of different colors and fabrics. Secure the ponytail holder top around the base of your braid, and simply weave in! Hesitant about diving into fall’s scuba-inspired trend? Unsure about wearing neoprene on land? You’re not alone! The look can be difficult to pull off, however, leave it to Proenza Schouler to provide a highly wearable option. Their leather-trimmed scuba jersey wrap skirt is a fresh, modern piece for fall. Pair it with a brightly colored sweater and black booties or low heels for a sweet, sophisticated take on an otherwise intimidating trend. Available at Netaporter.com! Jeffrey Campbell is known for making outrageously awesome, style conscious footwear, and the latest collection of boots and booties for the fall is no exception. The ‘Prance’ in sumptuous suede is a Western-ispired ankle boot with a 4″ stacked, chunky wooden heel and loads of fringe along the outer seam. Pair them with a maxi dress or slim pants to show them off, and don’t be afraid to rock these while the weather’s still warm. So cute right now. Find them on Barefoottess.com in black, tan, and taupe, sizes 11-14! 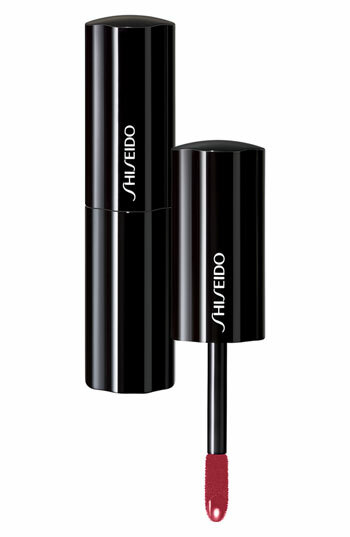 Luscious red lips are back in a big way for fall 2012, and Shiseido’s ‘Lacquer Rouge’ liquid lipstick in Nocturne is the perfect shade. A slight throwback to the 90’s with a hint of purple, this delicious lip color is part gloss, part rich lipstick, and it leaves a non-sticky, deep shine for hours. Go to Nordstrom.com to purchase!